Two of Cups Tarot Card Meaning - All Explained HERE! The Two of Cups is the second card in the Cups suit. Two two of cups shows a man and woman staring into each others eyes, gaze fixed over two large cups. The duality symbolism is clear; male and female on opposite ends of the card. The winged staff of the caduceus represents a mythic chimera; possibly something is amiss or unknown, although this does not signify deceit or lies. 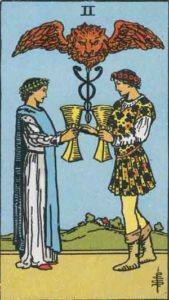 The Two of Cups represents partnership and cooperation. Past – The Two of Cups in the Past position highlights past relationships and how they have affected your life. Reflect on your past romantic relationships and long lasting friendships to see if there are any lessons that need to be learned. It can be easy to make the same mistakes again and again, especially when relationships are concerned. We are animals, and we have instincts which can sometimes overpower our reasoning. This isn’t necessarily bad, it is just how we are. Learn as much as you can about what you want in life by examining what you have done in the past. What did you truly like and dislike? Present – The Two of Cups in the present position means a new, good relationship may start. Look at ‘Romance’ and ‘Friends’ below. You never know what a relationship or friendship is going to be like when it starts. Now is a good time for you to look our for that perfect partner. Try not to settle for less. You might have to put in quite a bit of effort, emotionally, to be able to find the right person. Look to see if our life is somehow unbalanced and try to correct it if so, especially in any of your relationships, both romantic and friendly. Future – The Two of Cups in the future position suggests that you should look to your existing friendships and relationships for inspiration in the future. You know these people well, and nobody gets anywhere alone. The Two of Cups in Future can suggest a strong, happy healthy relationship. A great card to draw in this position if you are worried about who you will end up with, as the worry should be over. Work / Education – The Two of Cups in regards to work or education means that a partnership or team project is going to go well. Look to connect on a more personal level with your co-workers because you might find some interesting interests you share. You work and study for a large period of your life, so get to know those who you are spending so much time with, they are almost like a second family. You can change a workplace for the better when you think this way, and you can also change how you feel about working, or going to school. Romance – The Two of Cups in romance is a good sign for an already established relationship. You should be in a plateau; just relax and be yourself. Don’t force anything, this is the good part; you are both happy and content with each other, try to make this last as long as you can. If you are single, then simply look to strengthen your existing relationships. Share your emotions in both cases, the joy of a relationship is that you share an experience, it can mean so much more than going through life alone. Friends – The Two of Cups in regards to friendship is a good sign that your friendships are strong and a balanced part of your life. Try not to stress things or make plans, but be around and available. Try and have a common goal lined up in future with your friends; something to aim for. Maybe go and do something together, or go and experience something new that you used to feel was completely out of your league. Money – The Two of Cups in regards to finances suggests an equilibrium. Money is coming in and going out. Saving might be difficult now, but try to put some aside for the future. Try to lean towards the balanced, emotional aspect of the Two of Cups, don’t buy something thinking it will make you feel better, but also try not to neglect yourself. You need to eat well and enjoy yourself. Health – The Two of Cups might suggest that you need a second opinion about a problem you’re facing. Somebody may also confide in you about a particular ailment they have been secretly suffering from. You can help others by listening to their problems and giving advice based on your own experience. Be the friend people come to for help. Spirituality and Mentality – The Two of Cups in spirituality can mean that you’re feeling comfortable and aware of the current state of your life. Try to give more than you receive and help more than you wish to be helped. Try not to get stuck on mental baggage of the past. Look as parts of your life which you do not enjoy. How can you get rid of them, or at least change them to be more enjoyable? Getting stuck in a rut is one thing, but there is always a way to make your situation better. In reverse, the Two of Cups can suggest a lack of balance in your relationships. You might be finding it hard to really connect with other people right now. If you’re in a relationship, it may even suggest a recent or coming breakup. Don’t be alarmed if this isn’t what you want, any issues are likely to be caused by negative emotions being undisclosed. Communicate with each other, find out what you want and where this is going. You might not like it, but now may be the time to have one of ‘those’ conversations. Concerning friendships, look at your friends closely. Two represents duality, partnership and sharing. All twos symbolise this. The Two of Cups in a numerological sense may reflect that your life is currently quite balanced, although if you are looking to improve it, there is always a way. You will need to share the next stage of your life with somebody, this isn’t something you should do alone. There is likely somebody looking for you, possibly someone you used to know in your past whom you need to seek out. If you have a lots of Twos in a reading, it is a strong indication that your life in general is going to be okay, things could be better, they could be much worse. We’ve selected live tarot readers to give you a FREE 3 Minute interpretation of The Two of Cups! Scroll through them below and pick your favorite one.